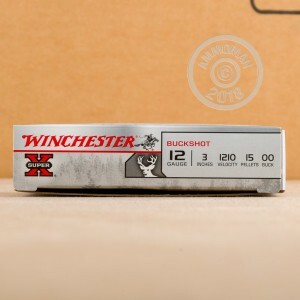 Winchester continues to impress with this 12 Gauge Winchester Super-X 15 Pellet 00 Buckshot! Designed for deer hunting, this shot will deliver the deadly shot you need to take home a prize. Each 3" load contains 15 pellets of 00 lead Buckshot. The high brass shell delivers powerful knock-down, even at long ranges. A one-piece hinged wad aids in making performance consistent and patterns tight. 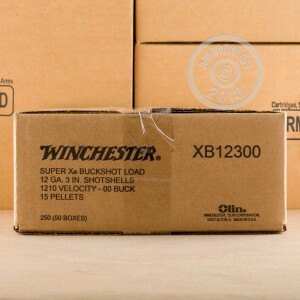 Winchester's 209 Primer and clean burning powder is used in the Super-X Buckshot for reliable ignition and velocity that is consistent. This ammo is also good for beginner shooters as it reduces the amount of recoil you feel from your shotgun, making shooting comfortable and reducing fatigue. Even when it's not hunting season, these loads are also good to have in your house for personal protection. 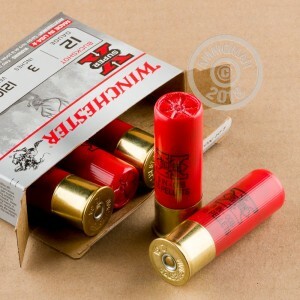 Winchester ammunition has a rich history, dating all the back to 1866. Their guns and ammo accompanied American settlers as they moved west to seek their fortunes. Today, Winchester is still referred to as "The American Legend". They maintain a high standard of quality, making their products stand above the rest.